NETWORK FINALS: NCIS gained 0.1 in final numbers, while MENTAL SAMURAI lost the same. CABLE HIGHLIGHTS: Despite a great deal of marketing and publicity, FX’s FOSSE/VERDON premiered at 0.13, a long way down from the 0.52 premiere of FEUD, a similarly older-skewing entertainment bio. 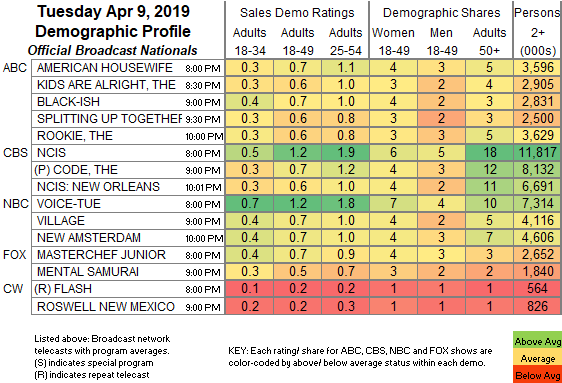 The Season 3 premiere of Freeform’s THE BOLD TYPE was at 0.09, arguably in line with last year’s 2-hour 0.14/0.09 premiere, but down from last season’s 0.13 finale. On USA, WWE SMACKDOWN rose 0.07 to 0.78. with lead-outs MIZ & MRS and GROWING UP CHRISLEY each up a tick, respectively to 0.42 and 0.26. On History, CURSE OF OAK ISLAND dropped 0.07 to 0.67, and LOST GOLD OF WORLD WAR II ticked down to 0.33. Bravo’s REAL HOUSEWIVES OF BEVERLY HILLS gained 0.04 to 0.47, and MEXICAN DYNASTIES was up 0.02 to 0.13. TNT’s NBA doubleheader was at 0.56 (Houston vs. Oklahoma City)/0.24 (Boston vs. Washington). 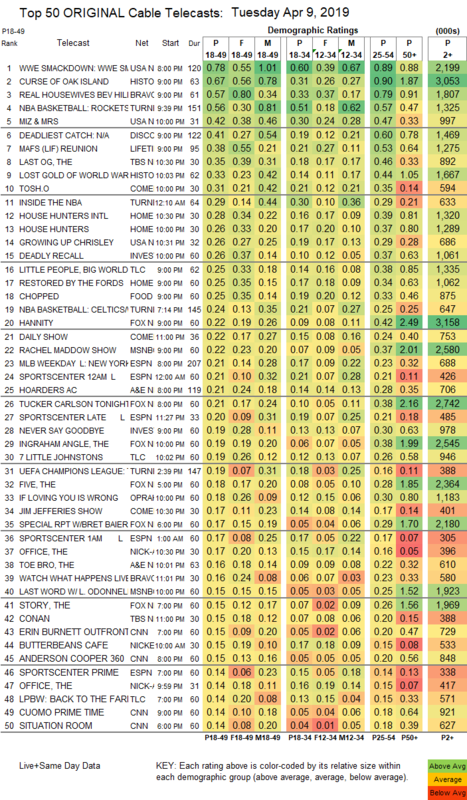 Discovery’s THE DEADLIEST CATCH was up 0.18 from last week’s special to 0.41. Lifetime’s MARRIED AT FIRST SIGHT reunion special was down 0.04 from last week’s regular episode to 0.38. TBS’s THE LAST OG dropped 0.05 to 0.35. On Comedy Central, TOSH.0 climbed 0.03 to 0.31, and THE JIM JEFFERIES SHOW was up 0.02 to 0.17. On HGTV, HOUSE HUNTERS INTL rose 0.07 to 0.28, HOUSE HUNTERS gained 0.04 to 0.26, and RESTORED BY THE FORDS was at 0.25 compared to last week’s 0.24/0.24. On ID, DEADLY RECALL ticked down to 0.26, and NEVER SAY GOODBYE was down 0.06 to 0.19. TLC’s LITTLE PEOPLE, BIG WORLD fell 0.06 to 0.25, and 7 LITTLE JOHNSTONS was down 0.06 to 0.19, and with the night’s opening hour, a MEGHAN & HARRY special, at 0.12. Food Network’s CHOPPED lost a tick to 0.25. There was a tie in cable news among 18-49s, with Fox News’s HANNITY at 0.22/0.42/3.2M and MSNBC’s RACHEL MADDOW SHOW at 0.22/0.37/2.6M, with CNN’s ERIN BURNETT OUTFRONT at 0.15/0.20/700K. On A&E, HOARDERS shed 0.06 to 0.21, and THE TOE BRO was down 0.04 to 0.16. OWN’s IF LOVING YOU IS WRONG slipped 0.02 to 0.18. The season finale of BET’s BOOMERANG ticked up to 0.12. I DVR’ed Fosse/Verdon, tried to watch it yesterday, gave it to 1/2 way and deleted it, boring and I like shows about Musicals.